There’s no wonder that the technological advancements have a significant impact on our lives. From navigation of apps, to guide you home safely, everywhere technology is playing a significant role. However, technology in healthcare industry is transforming convenience, patient communication, improving diagnosis levels and prove to be life-saving. The key technologies are providing the foundation for many booming healthcare innovations that are disrupting the industry. To keep pace with this continuous transformation, healthcare organization will need to embrace new technologies that will improve health outcomes, make it cost-effective, and provide value-based care. 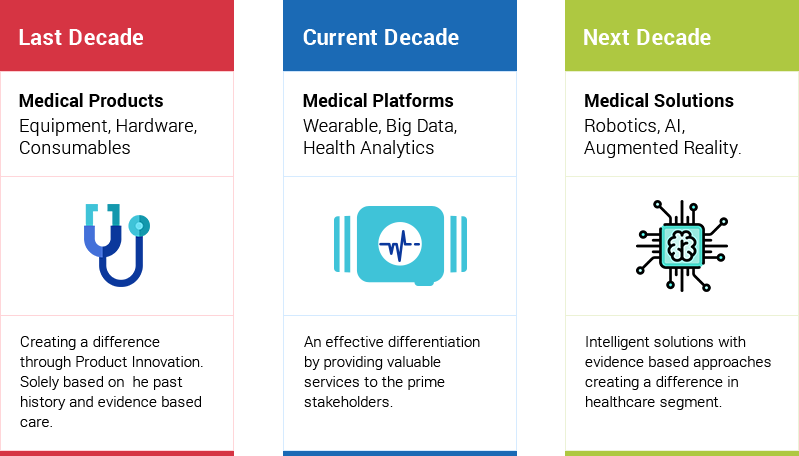 As healthcare shifts to a model of any-time, any-place, continuous and personalized care, it is essential to analyze the prime technologies that will redefine the future of healthcare segment in 2018. The emerging new technologies combined with the variety of new drivers that include technology-centric transformation not only leads to cost reduction but also ensures value-based care in the healthcare industry. Healthcare industry has been impacted in a substantial positive way in case of automation, machine learning, and artificial intelligence. According to a study from the University of Michigan, the transformation of information from the conventional paper to electronic health records through digitization reduces the cost of outpatient care by 3%. These researchers estimated this as $5.14 in savings per patient each month. Healthcare industry is facing revolutionary changes, looking out for the innovative ways to deliver the best patient outcomes while eliminating the dramatic healthcare expenses. What does the future of healthcare hold in 2018? Let’s look at six promising technology ready to transform the healthcare environment. Artificial Intelligence plays an integral role in reshaping healthcare. The adoption of artificial intelligence in the healthcare industry is gaining momentum and solving a variety of problems of patients, hospitals, and healthcare industry faces. It will provide much of the bedrock by powering predictive analytics and clinical decision support tools that help the providers into problems long before they might otherwise recognize the need to act. Nowadays every patient is digitally empowered and prefer personalized care that has more accountability and is also more affordable. Artificial Intelligence does have numerous implications on various fields of the healthcare industry that includes disease management, clinical trials, diagnosis and treatment, patient engagement, monitoring of the patient, and wellness management. AI is dominating healthcare treatments, such as making better treatment plans, assessing data to provide customized medication, and monitor procedures. AI has the potentiality to track the chronic diseases through MRI, CT scans, ultrasound and x-rays, and thus saving the time of the patients to wait for a diagnosis from weeks to a few hours. 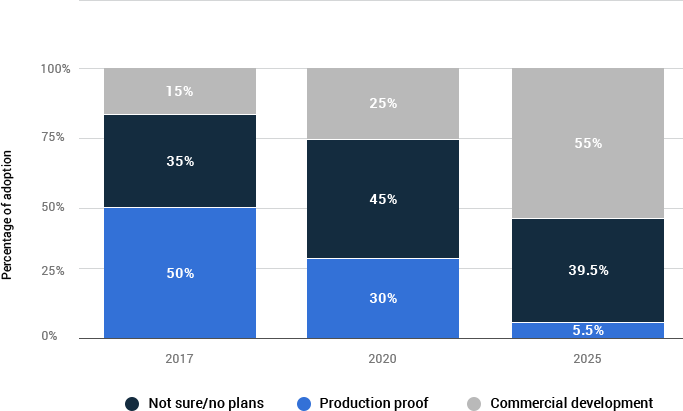 According to a 2016 report from CB Insights, about 86% of healthcare provider organizations, life science companies, and technology vendors are adopting artificial intelligence technology in healthcare. By 2020, these organizations will spend an average of $54 million on artificial intelligence projects. AI helps in compiling and analyzing information (medical records, patient information, and treatment history) using artificial intelligence and digital automation. Robots collect, store, re-format, and trace data to provide quick delivery of healthcare services. Analyzing tests, X-Rays, CT scans, data entry, and other tedious tasks can all be done faster and more precisely by robots. Artificial intelligence systems have been designed to analyze data, assess the reports from a patient’s file, and thus help them to choose a suitable treatment plan. With the power of AI, early detection of life-threatening disease is possible. AI helps in monitoring patient’s fitness level and send health updates to the respective provider to improve or alter patient’s treatment plans. The demand to bring dramatical changes has always been an underlying ripple in every facet of business, and when it comes to healthcare, this is done with a sense of inimitable urgency. Creating high valuable virtual records associated with a patient is one of the most significant challenges of healthcare IT. The blockchain is a distributed system that records peer to peer transactions, tracks the changes across networks, and stores and exchanges data for cryptographies. Blockchain technology has the potential to revolutionize healthcare, placing the patient at the core of the healthcare ecosystem and enhancing the security, privacy, and interoperability of health data. This technology will offer a new model for health information exchanges (HIE) by making electronic medical records more effective, and secure. This statistic depicts the projected distribution of healthcare blockchain adoption across healthcare applications worldwide, in 2017, 2020, and 2025. It is projected that 55 percent of healthcare applications will have adopted blockchain for commercial deployment by 2025. How Blockchain will impact healthcare? Security and privacy: Patient privacy and confidentiality are the prime issues within healthcare. For those in healthcare, necessary steps need to be taken to prioritize and improve security. Although there have been initiatives, blockchain could be the perfect solution for healthcare. Collaboration and governance: A massive amount of available data has increased in the past few years, and it will continue to do so. Blockchain would improve data governance, achieve greater ownership in the data, enhance interoperability, and result in better data-driven decision making. Data and analytics: Blockchain technology is defined as a shared, permanent record of peer-to-peer transactions that will provide new insight on how healthcare providers store and exchange data, resulting in greater transparency and trust. Shared data within the virtual database will lead to the continual updates, thus improving the real-time analytics. The health data volume is multiplying, and it is expected to breed dramatically in the years ahead. With more than 1.2 billion clinical documents are produced in the U.S. yearly, doctors and life scientists have an ocean of big data for their core research. Moreover, massive amount of health-related information is produced and shared with adoption of wearable tech. The wave of such data flow opens new opportunities for more informed healthcare. Data science stands an effective healthcare trend to optimize the way hospital operations are managed. With data science, the industry can find well organized, cost-effective ways to harness vast amounts of existing healthcare data, enhance its potential to revolutionize healthcare with a precise diagnosis. With the capability to collect, structure, and process a high volume of data and analyze a pattern, to gain in-depth knowledge of the human body is the essential requirement for data scientists and machine learning experts across the world. Despite having a vast amount of health data at disposal, the diagnostic failure rates are still high. According to the recent research by the National Academics of Sciences, Engineering, and Medicine, around 5% of adult patients are misdiagnosed every year in the United States making it a total of 12 million people. Additionally, the postmortem examination results research reveals that diagnostic errors cause almost 10% of patient deaths. Whether it’s predicting a patient with a tumor, the risk of re-admission, or the misclassified diagnoses in electronic medical records, data science plays a significant role. Data science will transform the future of the healthcare by managing and organizing enormous volume of data that will prevent healthcare problems and saving lives of millions. How Data Science Will Transform Healthcare? Disease Management: Employing data science can increase the accuracy and efficiency of the diagnosis. Big data also helps in reducing medication errors by improving financial and administrative performance and reduce readmissions. By detecting the disease patterns and recording disease outbreaks, public health issues can be improved implementing data science in healthcare. Patient Profile: An EMR contains the standard (structured and unstructured) medical data that can help to detect which patients are at risk and provide him adequate care. Advanced data science can be applied to patients’ profile for identifying individuals who can benefit from the proactive approach. It also includes lifestyle changes. 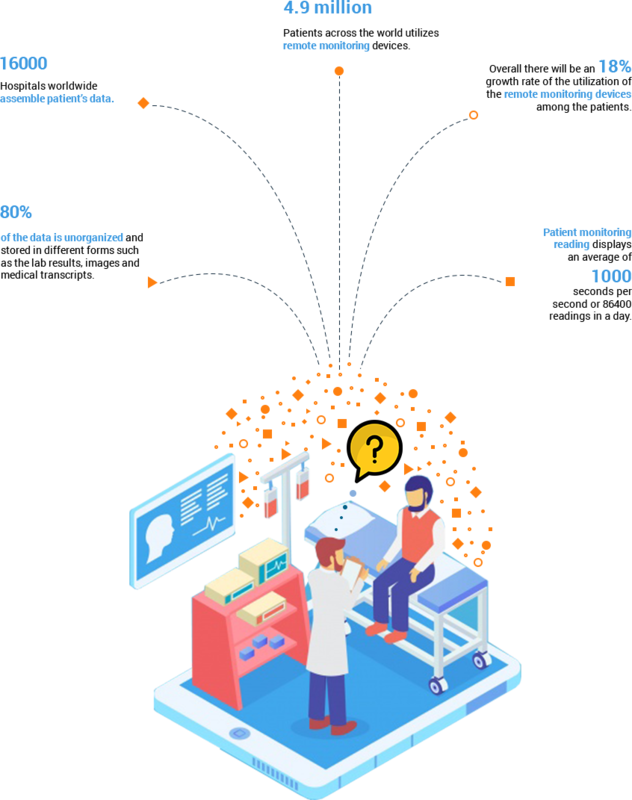 It is one of the critical technology in healthcare that can dramatically improve clinical decision making, administrative functions, patient monitoring, and pharmaceutical research is Machine Learning. By implementing machine learning technology in healthcare, we can– detect patient’s health real time, understand the disease patterns, find possible treatment, and analyze result with a clinical trial that is underway. 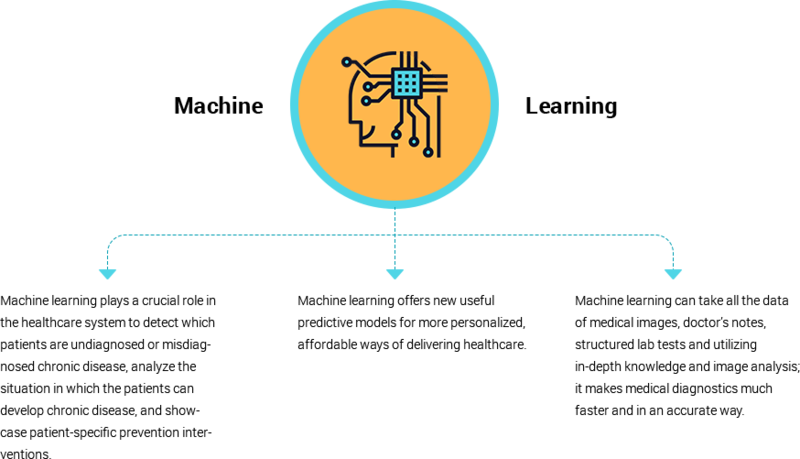 With the aid of machine learning, mobile-enabled care management platforms can be made available to offer all stakeholders customized plans, automatically adjusting based on experiences. Uncompensated care is one of the rapidly growing problems for most healthcare systems. With machine learning, health systems can determine who needs reminder alerts, who need financial assistance, and how the patterns of payment change over time. Physicians are smart, well-skilled and they like to stay abreast with the advanced research. It’s not possible for them to memorize and gather all the knowledge they require for every situation, and they probably don’t have it easily available at their fingertips. Though they have the access of the massive data in hand required to compare treatment outcomes for all various types of diseases they come across, but they still lack time and expertise to assess that information and integrate it with the patient’s own medical profile. But this kind of comprehensive research and statistical analysis is beyond the reach of a physician’s work. That’s why myriads of the physicians – as well as insurance companies – are adopting predictive analytics. Predictive analytics (PA) utilizes technology and statistical methods to gather huge amounts of information, that stands necessary to detect the patient’s outcome. That information can imbibe data from past treatment results as well as the advanced medical research published in peer-reviewed journals and databases. Not only can PA help to solve difficult issues and predict but it can also display amazing associations in data that our human brains fail to suspect. In medicine, predictions may vary from medication responses to hospital readmission rates. Examples are diagnosis of infectious diseases from methods of suturing, assessing the likelihood of disease, helping a physician in examination procedure, and even detecting the future wellness. How PA is improving healthcare? We all know that the early intervention is the key to preventing the severity of diseases. With predictive analytics, doctors can analyze the patient’s condition earlier, and make a much more informed call. Predictive analytics assesses the likelihood that patient can be sent home safely or taken under observation. Pharmaceutical companies are utilizing predictive analytics to detect the effects of old vs. new medication for a disease to aid their decision-making process. Make informed research on cancer, Ebola, HIV and other viruses. Predictive analytics in healthcare has been hugely significant in detecting a patient’s risk of contracting an illness by analyzing past treatment history, understanding the immune system of similar patients, and medications records. The more efficient way to prevent fraud and abuse is to detect it before claims are paid. Moreover, healthcare payers have now embraced the same predictive analytics to identify the fraudulent patterns and then develops sets of “rules” to “flag” specific claims. Artificial Intelligence and Machine Learning will massively impact on the healthcare ecosystem especially in the field of diagnostics, pathology, and radiology. Blockchain technology will emerge as a critical component of the healthcare system which will see an increasing adoption among the healthcare operators in the patient records management segments as patients demand greater control over their health data. Machine Learning techniques can help the healthcare business to run much more effectively and in a more predictable way. Data Science will see increasing adoption among medical care providers as it will contribute towards a range of operational functions in the healthcare. Technology has a lot of room for growth in healthcare, and in 2018 will see how companies are applying these intelligent tools to their organizations. Whether you are looking for an AI-driven solution or applying machine learning to your current healthcare software, you need a right team to create a smooth journey for you. If technology is one of your challenges, OSP Labs’ experts are ready to help!